Sardines are an irreplaceable fishing resource, a flourishing activity in all coastline towns in the districts of Naples and Salerno. There are many traditional recipes to prepare sardines in the south of Italy but the one of acciughe sotto sale is kept unaltered for taste and practical reasons as well. Storing in salt keeps the sardines good for months, so they can be consumed during bad weather and it’s not possible to go out to sea or when the fishing has been scarce. The procedure, used both by families and little trade companies, is to keep the fresh sardines under salt a first time for 2 days, and then cleaned completely, salted again and left under weights so that they push all the blood out naturally and finally they are left to mature. As a variation sometimes sardines are mixed with ground hot chili and garlic. Alici di Menaica - In the town of Marina di Pisciotta, near Salerno, you can buy straight from the fishermen little jars of anchovies known as “di menaica”, which have a very high quality white nearly pink meat with a special intense and delicate flavour. Anchovies di menaica are different even in the way they’re fished. The fishing ritual is practiced only by a small fleet of gozzi in Marina di Pisciotta and goes back to ancient times and remains intact through the centuries. During the night, under the stars, when the sea is calm, the fishermen go out on their gozzi and through their nets called “menaiche” they only catch the larger anchovies that die losing blood in the sea water. The fishermen delicately pull the nets by hand and pick the fish one by one out of the meshes, removing heads and entrails. Anchovies are put in wooden boxes without refrigerating means and are worked straight away in the first hours of the morning. They’re washed in brine and carefully put in enameled clay jars that can only contain a few kilos each. In the past when there was more fish it was put in “terzarole”, big wooden barrels. 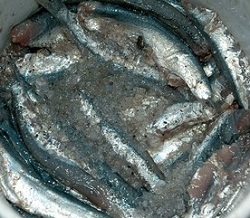 After been covered and pressed with stones the anchovies have to age for at least six months. Anchovies di Menaica are a result of an excellent culture interaction with the territory that has kept unaltered the skills necessary to keep all the necessary stages of production. Alice marinate - An ancient recipe to prepare anchovies, a high quality fish that can be found around Naples and Salerno’s coast, is the anchovies marinate. Mostly they’re served as an appetizer in all restaurants from Campania’s coast or can be bought in local shops. Following the traditional recipe anchovies are cleaned from the head, and entrails and bone are left to dry for 2 or 3 hours in plastic baskets and dressed with vinegar, lemon and salt. After being left to rest for a day they have to be dried well before being flavoured with oil and hot chili. 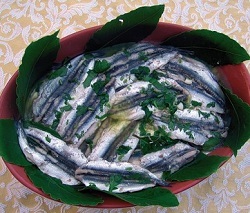 Filetti di alici sott'olio - The fishing of anchovies has consolidated many recipes for their preparation in all the coastal areas of Salerno and Naples. The anchovies are salted the first time in plastic or resin containers for about 2 days, they are then rid of the head and interiors and salted a second time in other plastic containers covered with wooden lids with weights that press on the anchovies so they will expel in a natural way the blood that is then cleaned. 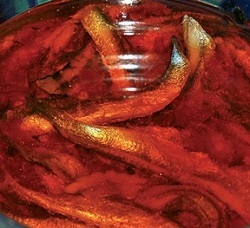 After aging for about 5-6 months the anchovies are washed in salty water and drained in plastic baskets for 16-18 hours, then hand filleted and preserved in oil. Colatura di alici - Cetara is a small village of fishermen in the province of Salerno and to this day its economy is still based on manufacturing and fishing. Colatura di alici (Straining of anchovies) is still present in the culinary tradition of Cetara, it derives from the Garum, a dish described to us by Plinio and Oracius as a creamy fish sauce obtained leaving to marinade layers of small fish, probably anchovies and bigger fish cut in pieces, maybe tuna or mackerel, with layers of ground aromatic herbs, all covered with coarse sea salt. Colatura di alici produced in Cetara is an amber liquid obtained using an ancient procedure that the local fishermen have passed form father to son. It starts by using anchovies under salt, and the drippings are derived from it: the freshly fished anchovies, during the spring time, are rid of the head and the interiors and then laid in a container, covered in sea salt and left for 24 hours. After the first salting, they are put in a small barrel, called terzigno and covered with a wooden disc with weights on it. The liquid secreted for effect of the pressure and the aging of the fish starts coming to the surface. This liquid is the base for the “colatura”: it is progressively collected, poured in big glass bottles and exposed to direct sunlight for about 4 to 5 months, to allow the water to evaporate and increase the concentration, therefore between the end of October and beginning of November everything is read for the final phase: the liquid collected and preserved us poured back in the terzigno still full of the anchovies. Dripping through the various layers of fish it will collect the best part of the organoleptic characteristics. It is then recovered through a hole in the terzigno and transferred to another container and filtered using linen cloths called cappucci. The final result if a clear liquid with a strong amber, almost mahogany brown colour, with a decisive and bodily flavor. In Cetara it is used as a spaghetti sauce during Christmas even, or to season bruschette, Christmas broccoli and other vegetables: traditionally it is considered a poor people’s food, a substitute to fresh fish, today it is a very sought for condiment and appreciated by all.